Hollywood Regency large pottery ginger jar with lid has gorgeous urn form with white glaze finish. Features both Chinese and Moorish inspired designs with lattice work throughout. Has tapered base and the lid features a stylized acorn finial or handle. Vintage Czech Republic handblown art glass vase with tapered form. Features beautiful translucent green glass with 24-karat yellow gold rim details. Pair of monumental neoclassical style lidded urns with removable lids and sculptural handles. Marked Italy on underside. Pair of Italian white ceramic urns. Large Italian ceramic vase. Measures: Diameter 32 cm. Height 51 cm. Beautiful Italian ceramic urn, very substantial in look and weight. Italian great vase ceramic design 1950 green, white points. 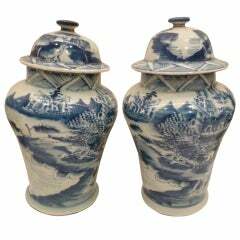 A fine pair of lidded jars or vases with traditional landscape scenes.